"Pepper & Carrot" is one of the few substantial adaptations of a work licensed under a Creative Commons Attribution-ShareAlike license. Marking a major milestone for the sustainability of free-culture production, David Revoy's popular free-culture fantasy web comic, Pepper & Carrot, about a young witch (Pepper) and her cat (Carrot), has been adapted into a motion-comic style animation by Nikolai Mamashev, produced by Konstantin Dmitriev's Morevna Project. In addition to the artistic achievement, this project sets precedents for the total lifecycle of free-culture works and demonstrates the viability of new financial models like crowdfunding and crowd patronage. Why do we use Creative Commons licensing? If you ask artists who choose them, one of the first reasons they give is the ability to legally share and remix—to make derivative works from them, especially new works under Creative Commons licenses. That's what we're specifically asking for when we choose a license like the CC Attribution-ShareAlike license. And yet, reuse of Creative Commons licensed work is not that common. Even when it's found, it's rarely substantial. That's why it's so exciting when a free-culture work is so beloved that it inspires follow-on work. This motion comic is a second-order free-culture project, in that it's a free-culture derivation of a free-culture original work. And that alone makes it a major milestone. 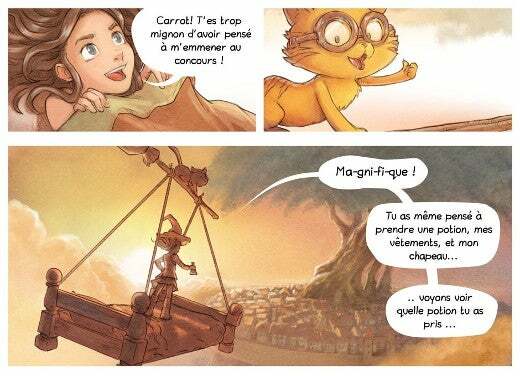 Pepper & Carrot is probably David Revoy's best-known work today, not only for the engaging art style and story, but also for the amazing system of internationalization, which converts the original French comics into 20 different language versions, which have been contributed by fan translators through the custom, open source web application he wrote. You might also have known him for his conceptual artwork for the Blender Institute's short film Sintel. The original Pepper & Carrot comic is one of the most popular free-culture art projects. Nikolai Mamashev is an animation artist who worked on Morevna Project's Demo animation (the seven-minute opening/fight/love montage from The Beautiful Queen Marya Morevna). He was responsible for most of the keyframes and animation. He has also created 2.5D Blender models for Pepper & Carrot and 3D versions of characters from Morevna Project. Konstantin Dmitriev has been working for several years now on Morevna Project, which is both promoting free-culture animation production in general and specifically creating a version of a Russian folktale about Koshchei the Deathless and Marya Morevna, adapted as a cyberpunk-themed anime. For the Pepper & Carrot project, he acted as a producer, most importantly organizing the voicing and sound-production work. In summer 2016, with Dmitriev's help, Mamashev launched a crowdfunding campaign to create an animated short based on one episode of Revoy's comic. Because of the open license, no additional permission was needed, but Revoy nevertheless enthusiastically endorsed the project. 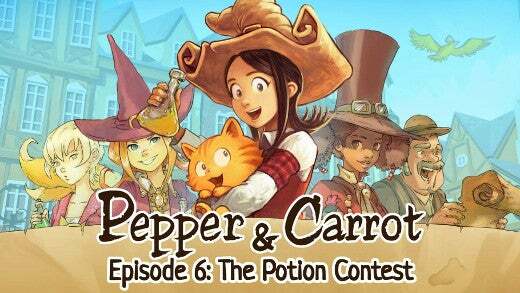 Pepper & Carrot, Episode 6: The Potion Contest, full episode. Terry Hancock: What led you to the idea of animating Pepper & Carrot? Nikolai Mamashev: Last summer, I was working on a teaser for my personal animation project, Morevna 3D. This was fun work, but making a 3D project on your own is exhausting. So I wanted to take a break and temporarily switch to something different to refresh my mind and motivation. I wanted something simple, something that could be done in a short time. So, I decided to try my skills in the motion-comic genre. But there was a problem—what exactly should I do? There's always a possibility to take some commercial freelance work, but I wanted to do something that is close to my heart, something that would allow me to be independent and unleash my creativity. And I wanted to do something open. And then one day it struck me—of course, it should be Pepper & Carrot! Blender also allows for rigging some effects in 3D. David Revoy, Nikolai Mamashev, CC BY 4.0. Konstantin Dmitriev: When Nikolai came to me with the idea, I was immediately convinced that it's a perfect fit: The artwork is already done, so he can concentrate on animation; the source files are available, so it would be easier to work with; and finally, it is published under the Creative Commons Attribution license, so that already gives the necessary permissions to use it for derivative work. 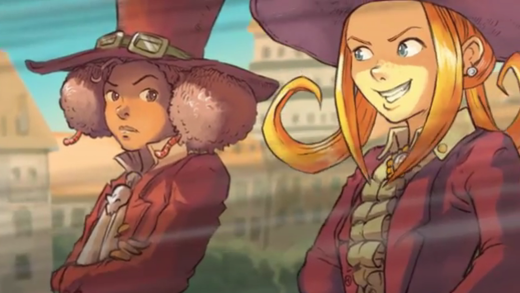 Characters Coriander and Saffron in a still from the finished motion comic. Terry: So the deciding factor was that David Revoy's web comic was open source? Nikolai: Yes, it was. Actually, I think that sources of Pepper & Carrot are just a treasure for an artist (whether working with animation or not). I am just surprised that there are almost no major reuse cases yet. Konstantin: This motion-comic project is just a single example from many other possibilities: You could cut characters and recombine them in different situations to tell your own story; you could make an interactive visual novel; the backgrounds are brilliant for animation in any fantasy theme; you could use the artwork to create cards for tabletop fantasy card games… the list can go on. Today we have awesome open source content, we have powerful, free tools to edit it, and I think now we have to learn how to use its full potential. For the small team, this is especially important, because it allows us to take on projects that we otherwise couldn't. Nikolai: In my case, I have saved effort on making the story and artwork, since it was already done by David. 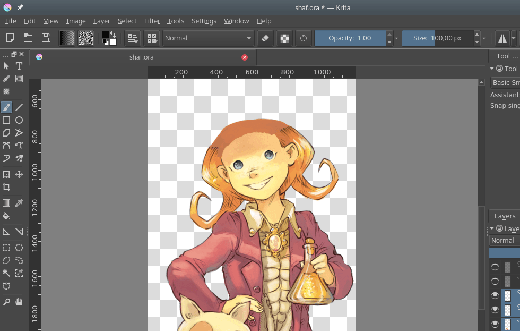 Work-in-progress screenshot of Krita being used for Saffron. Terry: Working from Russia, how were you able to find the voice talent for the English version? Nikolai: Yes, that was the first problem that we discussed when planning this project. To make this process more fun, we ran a contest for the best voice acting. I expected that with a big army of Pepper & Carrot fans, it would be easy to find voice actors. That worked. Terry: Do you plan to release versions in other languages? Konstantin: We have already produced a Russian version (which we used as a reference for the English version). For voicing in other languages, we are planning to publish a Dub Pack as we did for Morevna. This would allow anyone to create a localized version in their own language, similar to the translation of the original comic. Terry: What tools do you use for this project? Nikolai: For all my work, I use free and open source software only. 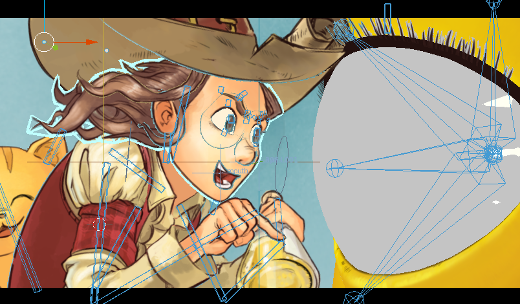 In this project, I am using Krita to split every web comic image into sets of separate layers and do additional painting to reconstruct areas where layers are overlapping with each other (e.g., if Pepper moves, then I need to paint the background behind her). Artwork recreated as animation assets. All layers are imported into Blender, and all the animation work is done there. For the importing, I am using COA Tools. This is an absolutely amazing add-on for Blender that allows you to quickly import layered images into your 3D scene. It saves a lot of effort, and I absolutely recommend this add-on to everyone who deals with cut-out animation (COA) in Blender. The rendering routines were automated using RenderChan, so anyone will be able to rebuild the project from the source files, which will be published. Konstantin: Actually, with this system, the sources could be rebuilt at any moment, even in the middle of production. Video editing in Blender's VSE. Terry: Do you have any message to developers of the tools you use? Anything to make the process easier for you? Nikolai: It would be awesome for COA Tools to be integrated with Krita. Currently, it only supports importing from Gimp or Photoshop. So, I have to save my layered images as ORA files, open them in Gimp, and then export them as XCF files to be imported. It would be really awesome to import directly from Krita files. But I've heard that Krita is going to get Python scripting capabilities, so I believe integrating COA Tools will be a "piece of cake" after that. In all other aspects, I am absolutely happy with my toolchain, so my message to developers is a big "thank you!" A sample of the work process used for animation. Terry: If you succeed, do you think this project could grow into something bigger? Animation process in Blender 3D. 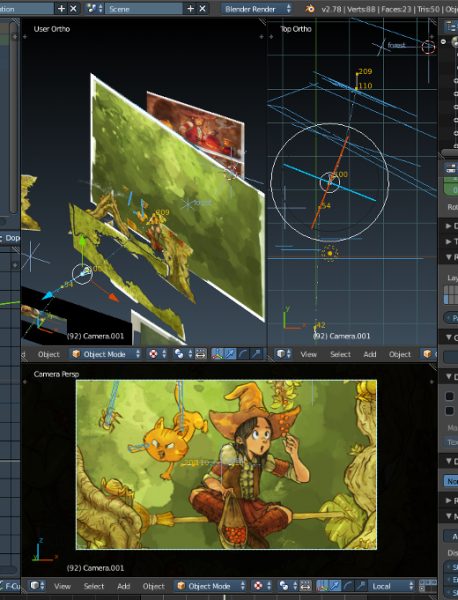 The Pepper & Carrot motion-comic project's animation was done entirely with open source multimedia applications. Open licenses for the content enabled talent from multiple countries around the world to collaborate on this project, and the major contributors, including the original comic artist, animator, and two of the voice actors, were even paid for their work through crowdfunding from fans. All of which makes this a resounding success for free-culture film and the open source software used to create it, which increases the hope that we'll see more such work in the future. I'd argue against the phrase "the few substantial adaptations", because if you look hard enough, you see nothing but substantial adaptations of Creative Commons work. You have to be dialed into the right communities, but there's a serious and strong artistic movement happening, among independent artists, building upon one another's CC work.